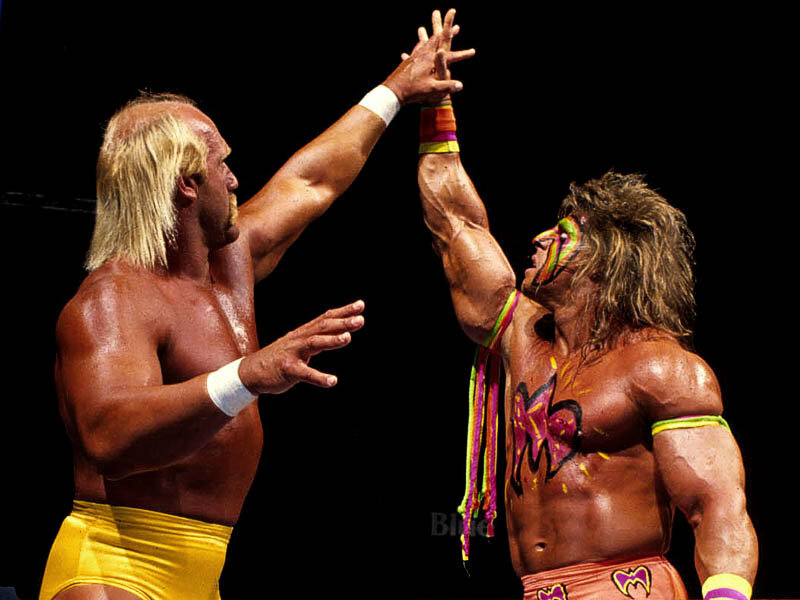 If you asked asked me who my two favorite wrestlers of all time were, I’d tell you Hulk Hogan and Ultimate Warrior. Hogan personified the American spirit, had awesome ring entrance music and knew how to pump up the crowd. Ultimate Warrior was a face-paint-clad, larger-than-life superhero. With colorful attire, mysteriously confusing promos and a ridiculous physique, he captured the attention and support of millions of fans in the early 1990s, including me. At WrestleMania VI in 1990, Hulk Hogan was the WWF (now WWE) Champion and Ultimate Warrior was the WWF Intercontinental Champion. The main event was these two titans going head to head, title for title – a first in wrestling up to that point. Having two babyfaces (i.e., good guys) go against each other was also a first for WrestleMania and it tore the crowd in two. Half of them wanted Hogan to win, while the other half was cheering for Warrior to reign supreme. Another element that gave it a big-match feel was the terrific commentary by Gorrila Monsoon and Jesse “The Body” Ventura. These legendary commentators had a wonderful chemistry that made the spectacle even more entertaining. It was a fantastic main event that is required viewing for wrestling fans, which is why I’ve included it below. It tells a great story that I still enjoy to this day. Andrew Gross, the bestselling author who co-authored six top-selling thrillers with James Patterson, has a new novel coming out on April 2: No Way Back. 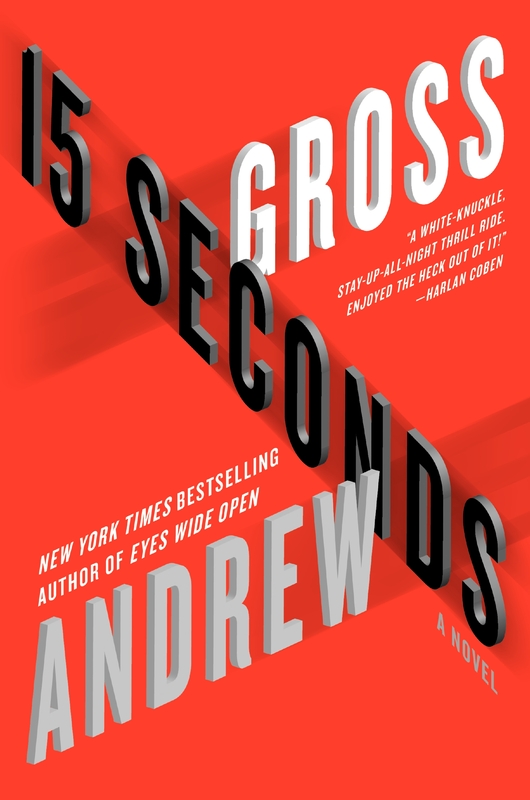 If you’ve yet to read his work, you should consider picking up a copy of his last bestseller, 15 Seconds, which is on sale for only $1.99 for a limited time. Below is a video of Gross talking about the premise behind 15 Seconds. 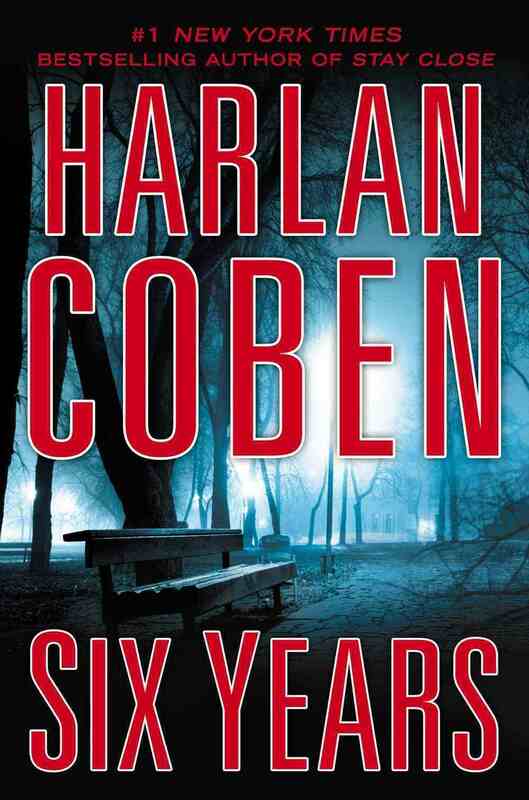 I recently finished reading Harlan Coben’s new novel, Six Years. I had high expectations because of its excellent early reviews, as well as what I learned during Coben’s recent book signing. I’ve read almost all of the author’s novels, and Six Years is easily one of his best. As you’ll read in the official synopsis below, this book is focused on the relationship between Jake Fisher and his true love, Natalie. For my money, no author has the ability to create vivid characters and palpable relationships the way Coben does. This story was told in the first person and done so effectively. As I was going through it, I felt just as confused as Jake, wondering what was true and what was false. I also felt his love for Natalie and his anguish over losing her, not to mention the roller-coaster-ride of emotions Jake experienced throughout the rest of the story. The first Harlan Coben book I read was The Innocent, and it’s my favorite, quickly followed by Tell No One. 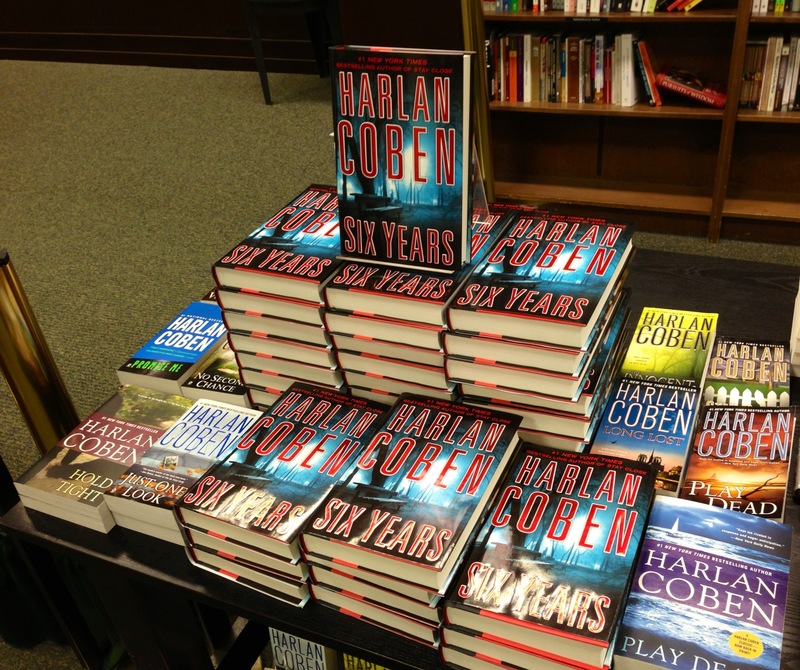 Six Years is one of Coben’s best novels. It grabbed me from the first page and never let go. Filled with compelling characters and mysterious circumstances, this twisting tale of suspense is a must read. You can read the first chapter of Six Years for free here, and below is an excerpt from the audiobook. I recently had the honor of interviewing Lisa Scottoline, the author of the wonderful novel Don’t Go, available April 9. As you’ll see below, her answers were a compelling and insightful look into the life of a bestselling author. I hope you enjoy the following Q&A. Shakespeare said, “Brevity is the soul of wit” while Ray Bradbury felt, “Digression is the soul of wit.” When setting out to write engaging dialogue for your characters, what do you find works best? What a great question! First, I never forget that the Shakespeare quote was in fact by Polonius, who is a bit of a fool, but he was definitely on the right track with his observation. I think I side with him more than Ray Bradbury, as great as Bradbury was. I say this because the governing principle of writing any novel, regardless of genre, is to get to the point. You really want to keep the reader engaged and turning the pages. That only happens if pace is paramount. Therefore nothing should be extraneous or extra. If you’ve made the point, you don’t need to make it again. Like I am now, in fact! Some authors outline books ahead of time, like James Patterson, while others, like Lee Child, just sit down and write without planning ahead. How do you approach writing a story? Do you know exactly what’s going to happen and when, or do you let the characters lead the way? I admire James Patterson, but I’m not as smart as he is, and I have much more in common with the wonderful Lee Child, in that I just sit down and write without planning ahead. I always say that not only do I not know how the book ends, I don’t even know how it middles. The great thing about writing is that there’s no correct answer and you get to do whatever works best for you. This works best for me because I like the spontaneity and excitement that not knowing what’s going to happen brings to me as a writer; I think if I planned it all out in advance in an outline, I would feel like the writing of it afterwards was like filling in the blanks, or playing Mad Libs. Also, the way I do it is unfortunately the kind of thing that leads to a constant state of anxiety, because I don’t know if I have a successful plot line at all, but part of me rationalizes even that. I think that being hyper-aware when you’re writing finds its way into the book and keeps the tension and excitement high, leading to that page-turner goal I always try to meet. Ian Fleming wrote 2,000 words a day by sitting down at his desk and typing non-stop for hours at a time. Do you have a strict writing schedule to which you adhere? This is amazing, because I never thought I had anything in common with the great Ian Fleming, but evidently I do. I actually sit down every day, 7 days a week, and meet a word count of 2000. I think that’s the perfect number because it takes the entire day and sometimes most of the night, but it seems to be about 9 pages and therefore enough to get out a single scene or plot element in a 1st draft. The good thing about having a word limit is not only does it enable you to get the words down the paper, which you absolutely must do in the end, but it also permits you a stopping point, in the event that you reach your 2000 word goal early. This happens to me a lot, and I like that very much. Mainly because, as anybody who works at home will tell you, it’s hard to turn work off when it’s just upstairs. If I meet my 2000 word goal at 7 o’clock, I can watch television or read without guilt, and that’s something to rejoice over. Many bestselling authors have started to co-author books. You’ve collaborated with your daughter and contributed to The Chopin Manuscript and The Copper Bracelet. Would you ever consider working with another author on one of your novels? I have cooperated and contributed to serial anthologies or chapter books for charitable reasons, like the ones you just mentioned, and I’m proud of my work in those things, but I never collaborated per se with another author in the actual writing of each sentence. I have already collaborated with my amazing daughter Francesca Serritella on the nonfiction humor books, but even there, she writes her own stories and I write mine, and we combine them in one volume. It’s hard for me to imagine a true joint production on something as personal and voice-laden as a novel, but I often think about writing a children’s book or something later with someone else. For that, we’ll have to stay tuned. What did it mean to you when you won the Edgar Award in 1995 for Final Appeal? I was really honored to win the Edgar award because it’s given by the Mystery Writers of America, which is our oldest professional organization, and I was even lucky enough to be nominated for the award the year before that, though I didn’t win it. I actually think that loss was an equally important accomplishment, because the ultimate lesson in writing is to write the absolute best you can for yourself, and not for any extrinsic reward, whether it’s a wonderful award like the Edgar, or even a newspaper or blog review. I read all of those things and I care very much about them, but I don’t write for anyone else but me, and my assumption is always that if I think something is wonderful, my readers will too. They are my highest and best award ever. Instead of the massive text and trite visuals most book covers are known for, your most recent novel covers have featured interactions between real people. Don’t Go has a beautiful orange glow to it and it features the book’s main character, Dr. Mike Scanlon and his daughter in a loving embrace. What led to this change in artistic direction a few years ago and what kind of feedback have you received from your fans? Another excellent question! This is a completely accurate observation and I have a wonderful publisher in St. Martin’s and a great editor in Jennifer Enderlin, and we have together come up with these new covers, which I love. At the macro level, I’m writing 3 books years these days; two novels – one of which is a standalone and the other is the next installment of the Rosato & Associates series – and a humor memoir. Our little team wanted to figure out a way to differentiate these books, so that readers could easily see which was a standalone, which was a Rosato, and which was the nonfiction humor. I think the covers accurately capture that, and at the same time they share a common font and typeface which ties them all together, since they’re all books by me. In my heart, I believe that if you like one type of book by me, you’ll like the other type, because the voice always remains the same, and I work hard on that. But I’m aware that some people will read only Rosato and some people will read only the standalones, and so I feel really happy that we are always accurately representing my work and positioning it in a way in which it reaches the most number of readers. Don’t Go focuses on the tumultuous life of a Doctor serving in the military. What was your inspiration for this novel? There were so many inspirations for this book that is hard to pick just one, but the bottom line is that like any American citizen, I have been following with great absorption and concern the progress of our wars in Iraq and Afghanistan, and I am overwhelmingly grateful to the men and women who fight them on our behalf, as well as to the families and friends on the homefront, who make their own sacrifices, though not the ultimate sacrifice made by the soldiers. I’d also read a lot about the effects of wartime on custody arrangements in general, and this idea came to me and so I went with it. More and more I think the standalone novels, and even the ones that feature Rosato & Associates, as a blend of love story, family story, and crime story. I have educated myself on the development of the mystery and thriller genre in general, and I think this is a natural direction for it to take, because it’s not just a few writers that transcend genre but in fact, all of us are transcending genre these days. Don’t Go is filled with interesting information about the day-to-day life of our armed forces overseas. Did you go into the book already aware of these details or did it require a great deal of additional research? I did so much research for this book it’s not even funny. I don’t think I have ever spent so much time researching a novel except for Killer Smile, which as you may know, involves the internment of Italian-Americans during World War II. The research in Don’t Go was for much of the same reason, too; wartime is a grave and dramatic time in the history of a nation, if not globally, and attention must be paid to the details. Everything has to be right, because real lives are being sacrificed in real time. I interviewed an Army surgeon who served in Afghanistan and he read everything in the manuscript to make sure it was accurate, which I think is the best you can do when you’re writing about an Army surgeon who served in Afghanistan. It’s straight out of the horse’s mouth, so to speak. I also read widely and extensively on the subject, both fiction and nonfiction accounts of both wars, I listed all of those books in the Acknowledgements. While none of them gave me specific ideas, because that comes only from my head and heart, they certainly help form a backdrop that would help me get the details right. Don’t Go is your 20th novel – a monumental accomplishment for any writer. Looking back, what’s your proudest professional accomplishment? Aren’t you so nice to say so, and I am very proud of producing a really fine body of work over the past 20 years. I really want the name Scottoline to be synonymous with quality fiction, whether it’s humor, crime, love story, or family story. But of course, I have to tell you that my proudest accomplishment is raising a wonderful and amazing daughter in Francesca. When I met you last year, at your book signing at Barnes & Noble on Rittenhouse Square, I was blown away by the fact that you remembered your fans’ first names upon seeing them. It was as if they were part of your extended family. After your first novel was published, how did it feel when people started to notice you and praise your work? I do tend to remember people because I am such a people person, and of course my favorite people in the world are my fans, because they support me, both literally and figuratively. There is absolutely no feeling as good as walking into a room full of people who read a novel written by you and therefore know your heart, the way you think, the way you express yourself, the values you value as important, and all of the other things that any good novel contains, which is some amalgam of heart, brain, and human soul. I remember my readers because I love them. It’s as simple as that. And going to any signing is like a homecoming, even though we’ve never met. That is proof positive of the magic of fiction, because it brings people together at a soul level. And I feel so lucky to be a part of that partnership with my readers, forever. And the interesting part about your question about when my 1st novel was published, how did it feel when people started to notice and praise my work, is that it doesn’t feel any different today than it did then. I still feel lucky and happy and surprised and blessed. I work very very hard, but I have a wonderful job, and I always endeavor to keep my side of my compact with the reader, which is to tell them a wonderful story, that even though it’s fiction, will contain an emotional truth that will resonate with them, and maybe help them deal with the ups and downs of their own lives, or maybe even encourage them through the tougher moments. Books do that for all of us, and I know it’s not only literally true, but that is a point worth making, because I get lots of e-mail from people who are actually convalescing or recovering from surgeries, were going through chemotherapy, or have just had a mastectomy, and all of them tell me that they managed to lose themselves in one of my mysteries or were laughing really hard at the humorous memoirs. Nothing can make me happier, and there is no greater purpose to fiction, or any form of writing, than to heal the human heart. 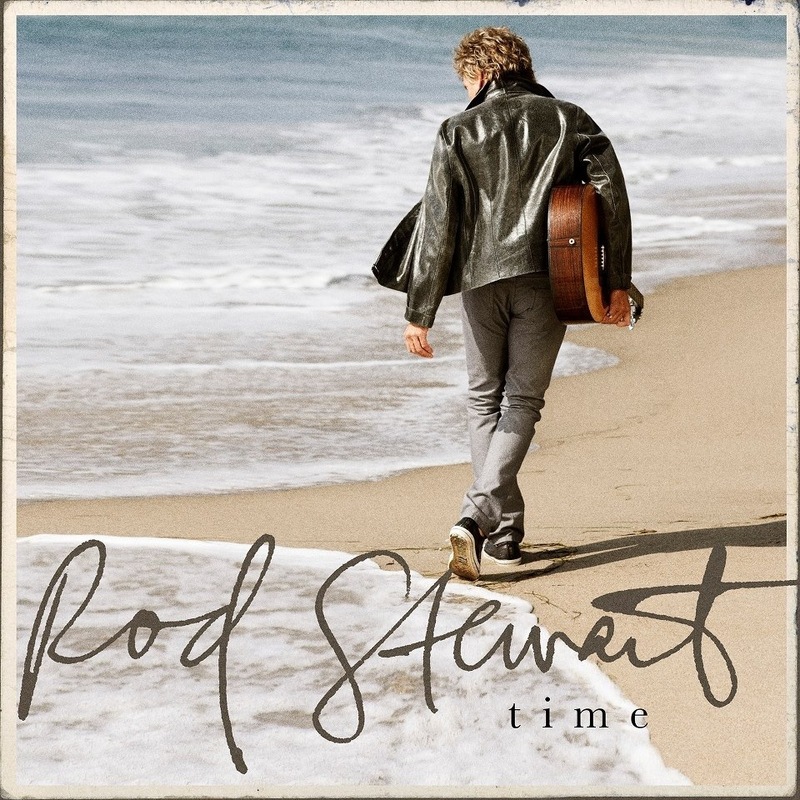 Rod Stewart’s first new album of all-original material in nearly 20 years is set to drop on May 7. Based on the sampler videos below, it sounds amazing! 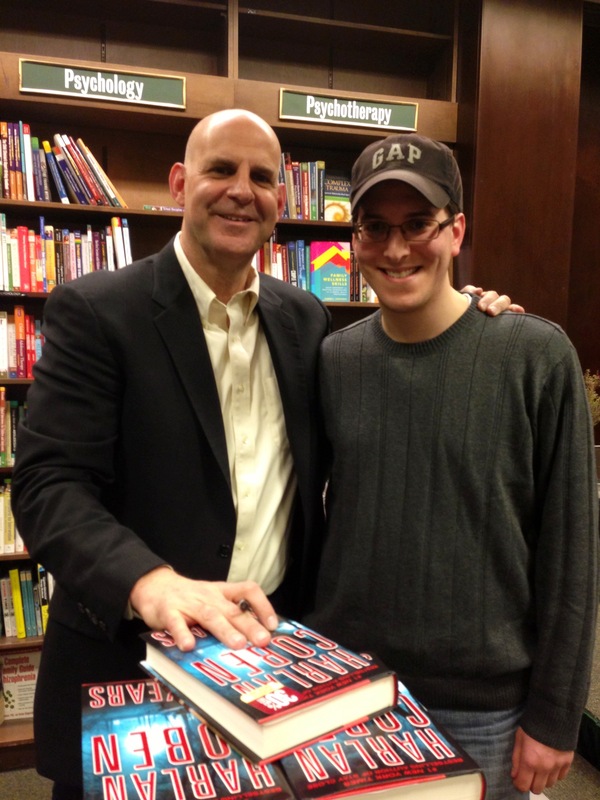 I recently met one of my favorite thriller writers for the second time: Harlan Coben. With more than 50 million books in print and his last five consecutive novels debuting at the top of The New York Times Bestseller list, Coben is one of the most successful and skillful authors. He rose to fame with Tell No One, which was turned into an award-winning foreign film, and Coben is also well known for his popular Myron Bolitar novels. If you enjoy thrillers or mysteries in any capacity, I urge you to pick up one of his books. They’re tremendous. But back to the book signing. 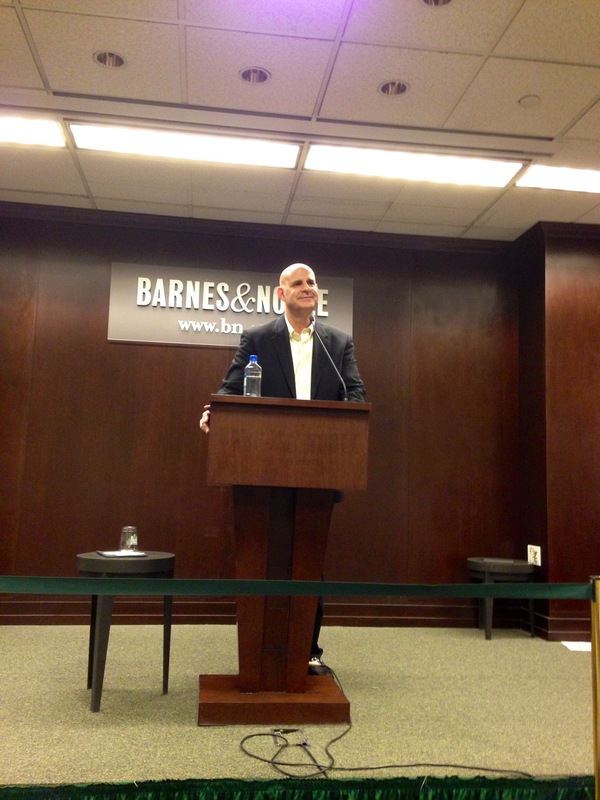 So there I was at Barnes & Noble with my girlfriend, eagerly awaiting the arrival of Harlan Coben. I was telling her about his sense of humor and how he doesn’t read from his books during these events. My goal was to make sure she understood this was not going to be a boring book signing. Having read three of his books prior to going, I had a feeling she would leave with a greater appreciation of the man and his work. When Harlan was introduced, I cringed as the book seller butchered Myron Bolitar’s name calling the fictional character Byron Molitar. It’s a strange name, no doubt about it. But either she or the person who typed up the sheet she read off of mercilessly destroyed Myron’s name. Who’s to blame? The world may never know. One of the most interesting pieces of information to come out of the evening was Coben’s criteria for what makes a good writer. “You need to have three things: inspiration, perspiration and desperation.” By this he meant, first and foremost a writer needs an idea to write about, following by a strong work ethic. Moreover, Coben feels that writers like himself are fearful of “having to work a real job” if their writing fails. This is where the desperation comes in. “I’m not fit to do anything other than write,” Coben said as fits of laughter echoed through the room. I had the opportunity to ask Coben a question during the Q&A portion of the event, and he graciously answered. It was about his thoughts on audiobooks, and he went on to tell us about his experience narrating one of his own books. “The producer in the studio told me to slow down and that I didn’t understand the characters. I wrote the characters,” Coben said with a chuckle. He also spent a great deal of time with fans signing books, answering questions, listening to their stories and posing for photos. There’s a reason why I go see Harlan Coben when he’s nearby. Not only is he a great author, he’s a great person. Similar to Lisa Scottoline, he’s genuine. If Coben comes to your neck of the woods, make it a point to attend. You’ll enjoy yourself. 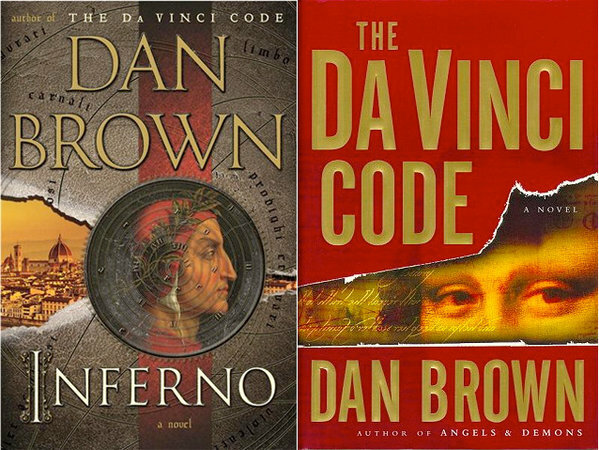 This week marks the 10th anniversary of Dan Brown’s most famous novel, The Da Vinci Code. To celebrate, the book’s publisher is allowing anyone to download the entire e-book for free between March 17-24. This free e-book also contains an excerpt from Brown’s upcoming Robert Langdon novel, Inferno. This is a brilliant way to promote a new book and a golden opportunity to snap up an engaging thriller for free. Take advantage while you can. I recently finished reading Lisa Scottoline’s new book, Don’t Go, available April 9. Below is my review of the novel, and in the coming weeks I’ll be posting an interview I conducted with the author about this book and her career. 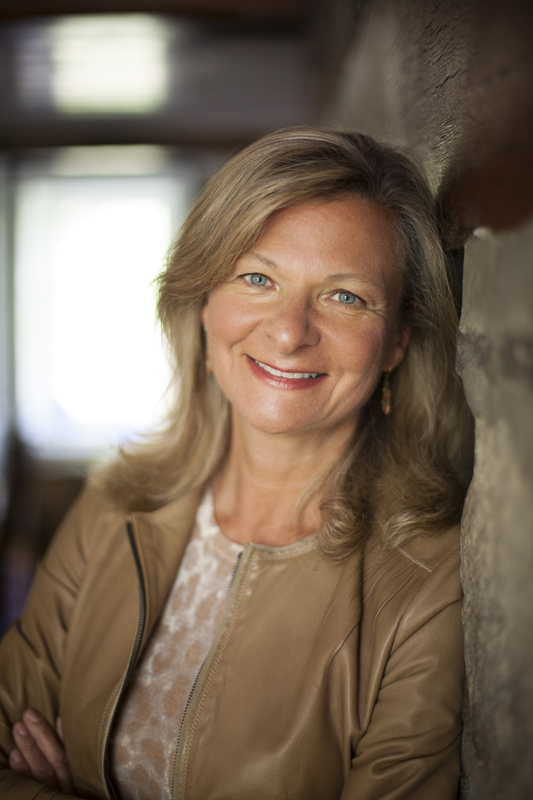 Not only is Don’t Go Scottoline’s 20th novel, but it’s the first time she’s writing from the point of view of a man. Up to this point, I had only read one other book by the author, Come Home, and it was pretty good. I never read a novel focused on a member of the military, and it wasn’t something that interested me. But I kept an open mind going into this book. To my delight, I quickly fell in love with Don’t Go and was fully engrossed in the plot from start to finish. Many of Scottoline’s recent books have focused on relationships between family members, and it’s something at which she excels. What really struck me was her effortless ability to construct magnificently descriptive prose that spoke to me. It not only carried me through the story, but it made me feel what the characters felt. Unlike some of her contemporaries, Scottoline’s writing comes off like she does in real life: Genuine. As you’ll see in the synopsis below, this novel focuses on the tumultuous life of Dr. Mike Scanlon. His wife dies while he’s serving as an army doctor in Afghanistan, and he’s forced to pick up the pieces when he gets home. He not only has to come to terms with his wife’s passing, he has to learn how to be a father to his daughter, who barely remembers him. It’s an emotionally-charged tale that’s peppered with Scottoline’s signature humor. And it’s filled with unpredictable twists and turns that kept me flipping through pages late into the night. Don’t Go was an excellent read, and I highly recommend it. It’s a compelling thriller filled with nuanced characters you can’t help but care about. Most of all, I loved how this novel had a theme weaved throughout. In addition to being the title of the book, the phrase “don’t go” is something Mike Scanlon hears and ponders during his journey. It’s a beautifully executed storytelling device that makes the title feel inspired and the plot cohesive. So far, this is one of the best books I’ve read this year. Be sure to add it to your list to check out, and look out for my upcoming post where I interview Lisa Scottoline about Don’t Go as well as her storied career. 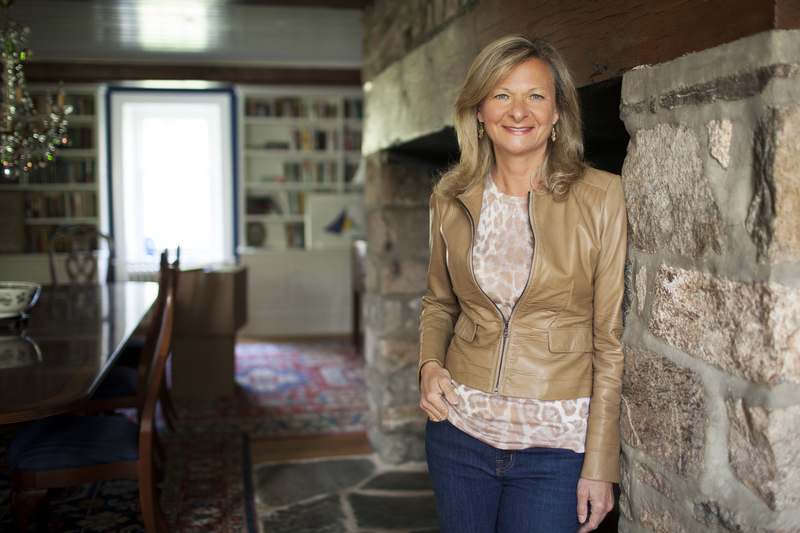 Lisa has thrilled millions with her emotionally-charged novels that feature strong women exploring the boundaries of family, justice, and love. In Don’t Go, she breaks new ground and delivers the story of a soldier who discovers what it means to be a man, a father, and ultimately, a hero. However, in an ironic turn of events, as Mike operates on a wounded soldier in a war-torn country, Chloe dies at home in the suburbs, in an apparent household accident. Devastated, he returns home to bury her, only to discover that the life he left behind has fallen apart. His medical practice is in jeopardy, and he is a complete stranger to the only family he has left — his precious baby girl. Worse, he learns a shocking secret that sends him into a downward spiral. Ultimately, Mike realizes that the most important battle of his life faces him on the homefront and he’ll have to put it all on the line to save what’s dearest to him – his family. 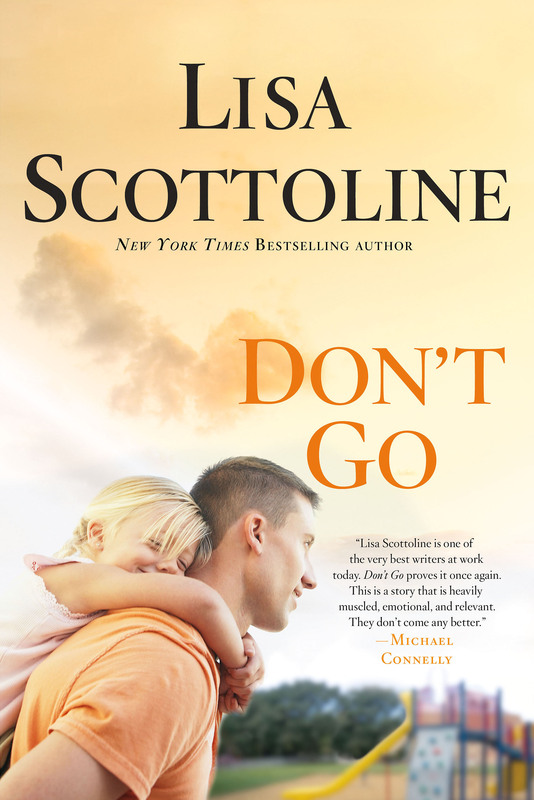 Gripping, thrilling, and profoundly emotional, Don’t Go is Lisa Scottoline at her finest. This past weekend at the supermarket was incredibly busy. The time sprung forward and the weather was beautiful. On top of that, it was the St. Patrick’s Day Parade in Philadelphia, which meant lots of jovial people walking – and stumbling – in and out of the food store wearing shamrocks, beads and anything green. However, it wasn’t the men in kilts blowing bagpipes or the old, mustachioed lady with shamrock antlers that caught my eye. It was Viagra Man. While ringing up waves of customers at my register, I longingly look at the front door, especially on a beautiful day, thinking about what it would be like to be outside. I also enjoy people watching. My eyes lit up and I guffawed when I saw an older man wearing a NASCAR-inspired jacket emblazoned with the Viagra logo on the front and the back. Immediately I wondered why he would be walking around in public in such garish attire. Was he a proud user of the popular drug? Was he being paid by Pfizer to wear this garment because he was an influential member of the geriatric social elite? There was only one way to find out why this man was OK with being a walking punchline. In between orders, I kept my eye on him as he traversed the aisles, secretly hoping he’d come to my line. But then I realized, how would I broach the topic of his ludicrous jacket without making him feel self conscious? After pondering this for quite some time, I looked up and saw that he was in someone else’s line. “Damn,” I said aloud to no one in particular. But then he disappeared and I didn’t see him anywhere nearby. I assumed he left without me noticing and my dreams were dashed. Approximately 10 minutes later I looked at the back of my line and spotted him. I almost yelled out, “Viagra Man!” But, thankfully, I contained myself. Once I starting ringing him up I said, “Are you a NASCAR fan?” He pointed to an illegible signature on the left breast of the jacket and I said, “What’s that?” He responded with a racer I never heard of before and told me the jacket was “a gift” and that he didn’t watch NASCAR because it was boring. I nodded my head in agreement and Viagra Man was on his way. I expected that an old man wearing such an outlandish piece of clothing would have been brimming with charisma and a bundle of energy. But he wasn’t. 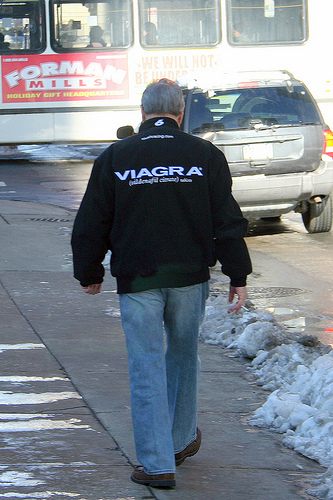 Viagra Man was simply a person who felt obligated to wear a jacket that was given to him by someone he loved. Either that or he was a damn good liar.